Star Plastics is a part of Star Group. 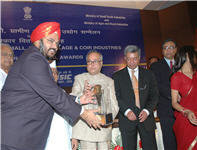 Star Group which proudly holds 3 National Awards and 1 J&K Govt. 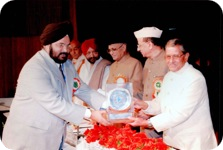 State Award was coined in the year 1995, by Sh. Yuvraj Singh Dua. The Group is engaged in the manufacture and supply of an assorted moulded and extruded products. Customized services are also offered by the company in accordance to the clients specifications. Within a vast experience of more than 18 years, Star Group has become a strong market leader in various plastic products in the state of J&K. Our products carry ISI (Bureau of Indian Standards) mark on them and are manufactured with best quality raw materials; sourced from international Quality Polymers producing Companies both from Indian and International Sources. The company is committed to maintain the established quality standards of its product range and endeavors to increase it with the increasing market demands. We always strive to exceed our clients’ quality expectations. Right from the selection of raw materials to the dispatch of final products, we perform various quality tests/analysis to ensure impeccable quality. Star Group is a versatile group having it's interests in variety of Plastic Products. 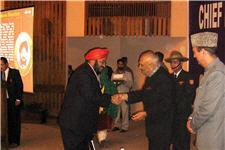 We have different Units for different divisions all located in Jammu, J&K. 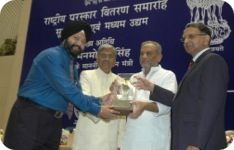 National award for outstanding quality. Star Plastics (www.starplastics.in) is the Roto Moulding division Star Plastics was coined in 1995. Star Plastics is the leading rotational moulded products manufacturer in the state of Jammu & Kashmir. Star Plastics is the flagship company of the Star Group and is well known for its superior quality products. Star Plastics is engaged in the manufacturing of Quality Rotational Moulded Products including Plastic Water Storage Tanks ranging from 100 Liters to 10,000 Liters, Dustbins, Open and Closed Top Containers. 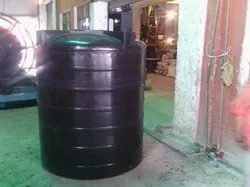 We have 21 models of vertical water storage tanks of different capacities ranging from 100L to 10,000 L. We also manufacture loft tanks and horizontal water storage tanks along with 2 models of Jumbo Dustbins of 125Ltr capacity. Certifications - Star Plastics is an ISO Certified Co. Our Water Tanks bear ISI Mark. Our Products are on DGS&D Rate Contract. Rainbow Plastics (www.rainbowplastics.in) is the Hardware and Custom Moulding Division division of Star Group. Rainbow was coined in 1998 and this facility is fully equipped with world class injection moulding machines and has been bestowed with the National Award for Outstanding Product Quality Products in 2005 by the Government of India. In this division, we manufacture a number of injection moulded items concentrating on hardware items and also do specific moulding jobs for some of the highly esteemed companies in our State. Plastic Manhole Covers - 10"x10", 12"x12", 18"x18", 18"x24", 24"x24". 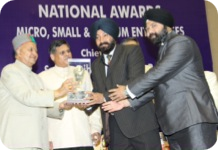 Paint Pails/Buckets - 5kg, 10kg, 20kg, 20 L.
J & k state award for exemplary entrepreneurship. Neptune Plastics (www.neptuneplastics.in) was coined in 2001. Neptune is the Furniture and Crate Division of Star Group. Neptune Plastics also has a blow moulding division apart from crates and furniture division, where a variety of HDPE Bottles and Open/Closed top Containers are produced for the pesticide industry. Our Furniture and Crate Division is served by one of the finest injection moulding machines in the state - Windsor Sprint 850 Tons. 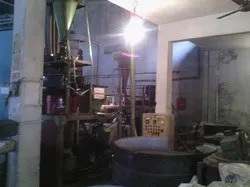 Neptune Plastics was the first company in J&K to bring a machine of this huge capacity. 'Star Foam' (www.starfoam.in) is manufactured at Neptune Plastics Unit II and is the newest member of the Star Group Family. Neptune Plastics Unit II came into production in April, 2009 and has one of the most exclusive foam technology plant in the state of Jammu and Kashmir. Over at Neptune Plastics Unit II, we produce one of the finest quality Extended Polyethylene Foam which is widely used in chilly areas as a carpet underlay for insulation against cold. We also offer packaging solutions to various esteemed companies, Hitachi for instance uses our foam fittings over in their electronic goods to safeguard the equipment. 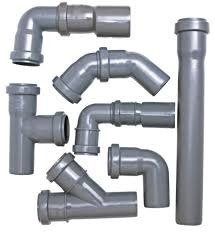 JAI ENETRPRISES (wwwdotstrapvcfittingsdotcom) is the PVC/UPVC Pipes and fittings Division of Star Group. Over at Jai Enterprises , we manufacture Rigid PVC and UPVC Pipes ranging from 50 mm to 225 mm dia at this facility and make all variety of SWR and Agri Fittings. Our products carry an ISI mark on them and are manufactured with best quality raw materials; source from established sources. Injection Molded Articles, Rotational Molding Products Up To 10,000 Liters Cap, Blow Molding Products Up To 100 Liters, Injection Molded Furniture Up To 5.5 Kg, Raffia PP/HDPE Extrusion Mfg Bags / Fabric, and PVC Pipe Extrusion Plant Up Tp 8 Dia. We have diversified in Injection Moldings at our new unit Rainbow Plastics. 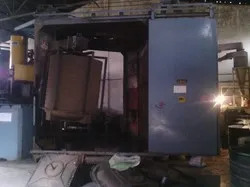 We have installed state-of-the-art six Injection Molding Machine of Windsor India make. Our company is here engaged in manufacturing Injection Molded Sanitary Goods. In a bid to further expand our activities we established a premier Injection and Blow Molding Unit at Bari Brahmna Jammu under the name and style of M/S Neptune Plastics. These products are made using 850 Tons CT of Windsor Make and fully computerized Injection Molding Machine. Here the unit is franchise manufacturer of moulded furniture of “ PRIMA” brand. The group has also diversified in production of rigid PVC Pipes using Extrusion Plant of DGP Windsor Make. Last but not the least we are also indulged in production of Raffia and have installed Tapeline of Kolsite Make supported with World famous Battenfield Screw Technology. 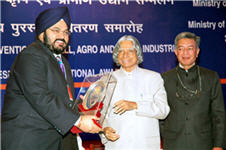 Our group was the first to establish Raffia Tapeline Plant in Jammu. We possess a diligent workforce that strives to achieve company’s objective of total customer satisfaction. We have divided the entire workforce into different teams on basis of different departments. This systematic categorization of our workforce has allowed smooth and easy production and delivery of our products to our clients. We hold regular training sessions for our workforce to enrich them with the latest market developments. In addition, these sessions are also targeted towards developing and enhancing their work and interpersonal skills. Such training sessions are very important to enable our personnel to understand the complete concepts of the technologies used in our company. We employ innovative and efficient technologies in our company. These technologies allow us to manufacture a modern and up-to-date product range. We strive to better our repute in the market for acquiring effective and efficient technology. Together, training and technology form the core of our business.